Beautiful Centerville brick home just a couple minute's walk from N. Main St (SR 48). Great 4-bedroom, 1+ bath layout in Cape Cod style. JAMESTOWN FIXER-UPPER - ABSOLUTE AUCTION! 1-Story Bungalow with Loads of Upside Potential! 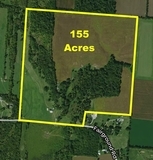 1.52 Acres located between Springfield & Enon. 4 bedrooms, 2 full baths & full unfinished basement, plus nice 2-car det garage, 2 small animal sheds & fenced pasture. Great Potential!